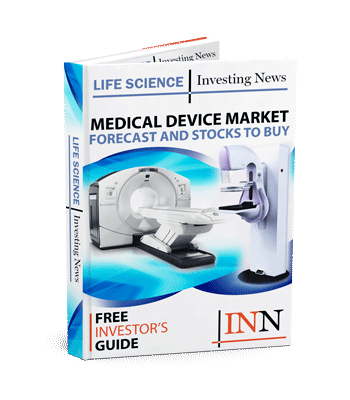 The Investing News Network takes a closer look at surgical robotics stocks to give investors an idea of some of the biggest names in the industry, as well as some lesser-known companies that are still working on product development. If top surgical robotics stocks companies continue on the current path rapid of advancement the days of triple ports surgical systems may soon be gone. This technology isn’t for one specific surgery either, the top surgical robotics stocks have developed products for many surgeries, including cardiac, spinal and endoluminal. Surgical robotics have increased surgeons’ performance ability, lessen scarring, incisions and blood loss, and more. Other benefits of surgical robotics include complete control, safer surgeries—especially for nonsurgical candidates—and a more comfortable recovery. However, even surgical robotics have negative media attention. The Netflix documentary The Bleeding Edge, was released in July 2018, showing negative sides of five medical devices. Some stories include patient and expert experience with Intuitive Surgical’s da Vinci. Time will tell if this negative press will lead to product or business changes. Here the Investing News Network (INN) is taking a closer look at surgical robotics stocks to give investors an idea of what some of the biggest names in the industry are, as well as some lesser-known companies which are still working on product development. The companies listed below are in alphabetical order and figures were taken from Google Finance as of market close August 14. Possibly one of the most well known companies to develop surgical robotics products and systems, the da Vinci and its updates, makes Intuitive a global leader. Started in 1999, the da Vinci system is used internationally and aids cardiac, thoracic, urology, gynecologic, colorectal, pediatric and general surgeries. Intuitive announced a 20 percent increase in revenue of US$909 million compared to US$759 million for the second quarter of 2018. The company also received US Food and Drug Administration (FDA) clearance for three product from April to July 2018. Second on our top surgical robotics stocks list is Microbot Medical. Although the company does have a focus on micro-robotic-assisted medical devices, it also has a hand in surgical robotics with its acquisition of CardioSert’s technology. The device uses a combination of guidewire and microcatheter technologies used for endoluminal surgery. Aside from the CardioSert technology, Microbot received a global IP issued patent in India to cover the company’s ViRob, a crawling micro-robot which can crawl through the digestive tract, the respiratory system and blood vessels. Mazor sets itself aside from other surgical robotics companies by arguably working on some of the most sensitive procedures. The MazorX and Renaissance both work on spinal surgeries, whereas the latter can also be used for a variety of stereotactic brain procedures. In the company’s Q2 2018, financial results, Mazor reported US$14.5 million in revenue for the quarter, which was US$2.3 million more than the same quarter in 2017. The company also anticipates a market-changing event with introducing the Mazor X Stealth Edition system in September. A company well-known for orthopaedic reconstruction, advanced wound management, sports medicine and trauma & extremities, Smith & Nephew landed on our surgical robotics stocks list from the Navio Surgical System. The Navio works on both partial and total knee replacement procedures. In the company’s Q2 financial results, it reported an eight percent revenue growth for the Navio Surgical System. Overall the revenue increased to US$1.255 million, a four percent increase from the same quarter the previous year at US$1.19 million. Another popular choice for medical and surgical equipment, and orthopaedics alike, Stryker also has the Mako robotic-arm system for for joint replacement assisted surgery. The device offers partial knee, total hip and total knee applications for surgeries. Stryker reported net sales increase of 10.3 percent to US$3.3 billion and organic net sales increase by 7.9 percent from the same quarter in 2017, as reported in the Q2 financial results. Though Mako wasn’t listed on the Q2 financial results, medical and surgical equipment accounted for 8.9 percent reported net sales growth for the quarter. Renishaw is engaged in aerospace, automotive, precision manufacturing and more, including a division in medical and healthcare. In the latter sector the company developed the Neuromate stereotactic robot for electrode implantation procedures for deep brain stimulation (DBS) and stereoelectroencephalography (SEEG), as well as stereotactic applications in neuroendoscopy, biopsy, and many other research applications. The Neuromate Gen 3 with the neuroinspire surgical planning software was just cleared for sale in the US on June 1 2018. Then at the end of July, the company reported record revenue in its June 2018 annual results of £611.5 million with growth constant exchange rates of 18 percent. Titan Medical lands itself on our surgical robotic stocks list as one of the companies in development. Titan is developing a single-port robotic surgical system, the Sport. The system may include indications for gynecologic, urologic, colorectal or general abdominal procedures. Once only listed on the Toronto Stock Exchange, Titan uplisted to the NASDAQ at the end of June 2018 in an effort to attract institutional investors. The company then issued an additional public offering mid-August for gross proceeds of over US$19.19 million. Last on our surgical robotics stocks is one of the newer companies to the space, Transenterix. Its Senhance Surgical System has surgeon camera control via eye sensing and haptic feedback among other features. The product is available in the US, the EU and select other countries. Until the end of May 2018, the surgical system could only perform laparoscopic colorectal and gynecologic surgeries, but the company received FDA clearance for some of the most common abdominal surgeries in general surgery and gynecology. As per the company’s Q2 financial results, the company reported a revenue increase to US$11.15 million, from $3.53 million for the six months ending June 30 2018 compared to the previous year.